SolidEnergy is an MIT spin-off with a lithium battery that’s been touted by R&D Magazine as “potentially…the biggest breakthrough in battery technology since Sony introduced the first Li-ion battery in 1991.” Unlike other manufacturers with indefinite product dates, SolidEnergy says it will release a 2 Amp-hour smartphone and wearable battery in 2016 and a 20 Ah electric vehicle battery in 2017. SolidEnergy claims their Solid Polymer Ionic Liquid (SPIL) electrolyte enables creation of an “ultra-thin lithium metal anode, and improves the cell-level energy density by 50 percent compared to graphite anodes and 30 percent compared to silicon-composite anodes.” The electrolyte adds non-flammability and non-volatility, operating safely at temperatures up to 300° C.
We reported on this company last year when Dr. Qichao Hu, CEO and Chief Technology Officer of SolidEnergy, spoke at the eighth Electric Aircraft Symposium in Santa Rosa, California. Dr. Hu led a team of six associates in developing SolidEnergy Systems’ Solid Polymer Ionic Liquid (SPiL) rechargeable lithium battery. Sometimes referred to as the Magnificent Seven, their plans carried to fruition will be magnificent indeed. Front row (l-r): Ke Zhang, Jaehee Hwang, Chaojun Shi. Back row (l-r): Qichao Hu, Arun Tiru, Yury Matulevitch and Xiaboo Li. One of their features involves manufacturing: the best battery in the world means very little if it can’t be made in quantity. 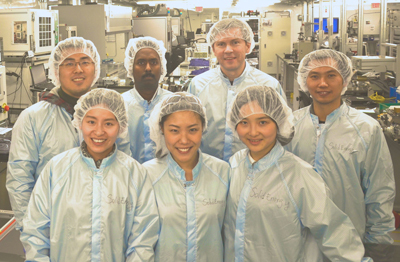 SolidEnergy’s cells can be made in existing Li-ion facilities. Because of that, the process can leverage a mature infrastructure. A123 Venture Technologies has partnered with SolidEnergy to facilitate that. The battery’s makeup is instructive, as explained in Green Car Congress’s write-up. A “solid graft copolymer electrolyte (GCE) combined with a lithium salt becomes a solid electrolyte, looking and feeling like a “rubbery solid but still possessing high ionic conductivity: a block copolymer electrolyte (BCE).” A solid polymer coating “with dendrite-suppressing additives” surrounding the anode (essentially the pouch case) prevents the growth of spikes that would otherwise penetrate the anode and cause short circuits. Moving from prototyping to full manufacturing puts the group in a competitive position with other advanced battery makers such as Sakti3 and rewrites the normal ending to these stories. Instead of the usual “Commercial production is expected in five to ten years,” we can look forward to seeing these batteries in consumer products next year, and in our electric and hybrid cars in two. The future grows closer.